President Yameen’s visionary foresight, meticulous planning and determined policy implementation has seen the Maldives establish a Medical College, a National Uro-renal and Fertility Centre, a National Cardiac Centre and the introduction of treatments in Haematology, Neurology, Cardiology, Fertility and Reproductive Medicine, Nephrology, and several other specialist disciplines in addition to the ambitious Dharaumavantha Hospital project, within his first term in office. 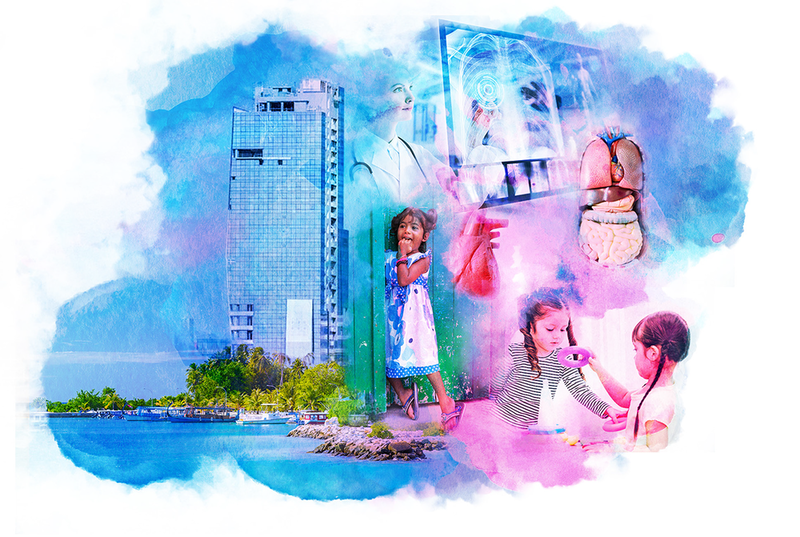 President Yameen’s PPM government will mould a modern health care system that is accessible to all and establish Maldives as the leader in regional healthcare services. We will establish the first organ transplant centre. We will raise the standards of service in all regional hospitals to establish them as multispecialty hospitals and provide the highest quality of healthcare across the country. We will establish a National Medical Diagnostic Network that connects all regional hospitals electronically to the National Diagnostic Centre at Dharumavantha Hospital. We will link all healthcare centres via a telemedicine network, within the Smart Maldives initiative. We will establish a specialized national maternity and child care hospital in the Greater Male’ Region to offer specialized fertility treatment, family planning counseling, specialized neo-natal and foetal diagnostic services and treatments. We will implement phase II of Dharumavantha Hospital to deliver an 850 bed multidisciplinary medical facility, boasting specialty clinics from renowned global healthcare providers, with satellite centres in Addu City Hithadhoo and H.Dh. Kulhudhuffushi. We will restructure the Aasandha scheme to enable greater access to healthcare for all. We will introduce paramedics units, to offer timely emergency medical care to critical patients in urban centres, prior to the arrival of a four-wheeled ambulance. We will establish sports physiotherapy centres in all regional hospitals. We will provide free test and monitoring kits to all hypertensive and diabetic patients. We will increase the number of doctors in the country by establishing an internationally accredited medical university to offer world-class training to local students.